Everyone loves a secret—especially when it comes to heroes. The moment I learn a romance hero has a dark past, I want to know what tortures him. Especially if it's damaged him in some way. What molded him, twisted him into the man he is? And how can I (the heroine) save him?? If he has become an anti-hero (read alpha-hole) because of his past, I want to know why. And it had better be good! ‘Cause if he’s just a jerk … there’s no cure for that. Luckily for us, there are so many ways to turn a sci fi hero dark and yet sympathetic. Roarke in J.D. Robb’s IN DEATH series, rose from the absolute bottom of the gutter, to become the clandestine ruler of the underbelly of a futuristic NY City. Only his love for a stubborn cop might convince him to go straight. Assassin Eril Morav in Jessa Slade’s SHEERSPACE series. This man has been brainwashed into believing he exists only to destroy rebels. Will he kill cyborg warrior Shaxi, or save her? Rees in Allyson James’ TALES OF THE SHAREEM. Created to be an enhanced gigolo on a planet of women, this incredible male is willing to kill to escape—until he meets his heroine and decides he’d rather please her and then murder her. Whoa, these men all have very good reason for their dark ways, and they’ll take us on a hard chase before we discover whether they have that essential spark of nobility deep inside. Logan Stark, the hero of my LodeStar smexy sci fi futuristic romance series, is an anti-hero. He's a wealthy man, with employees at his beck and call across the galaxy. He owns factories, a fleet of new space cruise ships, and interests in exploratory industry on the new planet of Frontiera, including a mine full of precious irridium ore. He has people who do what it takes with savvy, experience and the latest tech. He's also secretive, emotionally closed off, and manipulative, moving people around like holovid chess pieces. And when he feels betrayed, watch out! He does not forget or forgive easily. How did Stark come to be this way? Why is he so obsessive with providing his two younger brothers with everything they need for happiness, while remaining aloof himself? Can he extend this protection and care to a woman? Or will she become just another acquisition, another mark that he’s a success? Find out in Stark Pleasure; the Space Magnate’s Mistress, Book 1 of The LodeStar Series, FREE on all online sales outlets! And I KNOW you have a favorite dark SFR hero of your own! Who is he, and why do you love him so? Let us all know, won’t you? ... it's hot in space, red hot! In any genre, the world our characters inhabit add a richness to our stories. In contemporary stories, we can visit the world, or perhaps we live in a similar village, town, or city. In science fiction, we have all kinds of possibilities. We can decide everything about our world. The type of government that rules, religion, vehicles, food, creatures, climate, employment, day-to-day activities. The galaxy is our playground. Our methods of determining our worlds are as diverse as our writing methods. Those writers who are plotters will set up their world first. Just as they outline their plot and do detailed analyses of their characters, they will write out all aspects of their world before ever writing a word of their story. Pantsers have a different way of setting up their worlds. Since I’m more of a pantser than a plotter, I determine my world as I go. As with any details, I must keep track, especially if I’m writing a series. As the series progresses, my imaginary world expands. I may start out with a vague idea of the culture, but I’ll keep adding details as the story demands. I’m sure to a dyed-in-the-wool plotter my methods seem haphazard or random. But it works for me. Whether your world evolves along with your characters or is fully fleshed out before you write “Chapter One,” make sure you are consistent. Decide the rules. Make sure your characters abide by those rules or have a darn good reason for breaking them. In my upcoming science fiction romance, The Protector, I already established the culture in two previous books—a central government with representatives from several planets and that area beyond the reach of that government, the Outer Rim. I modeled my world after the frontier in 19th century America. The colonies are still pretty wild with people who want to get away from the “civilized” world and want to be left alone. Then I threw in a gangster who capitalizes on the lack of law enforcement. The conflict possibilities are endless. In each of my Outer Rim novels, a strong woman foils the gangster’s plot to rule the galaxy. After tavern owner Rissa Dix rescues two girls from a slave ship, she must rally the townsfolk to prevent traffickers from raiding the frontier colony. She’s met with apathy and disbelief. Because she lost her own baby to traffickers, she’s determined that no other mother will suffer the same heartache. 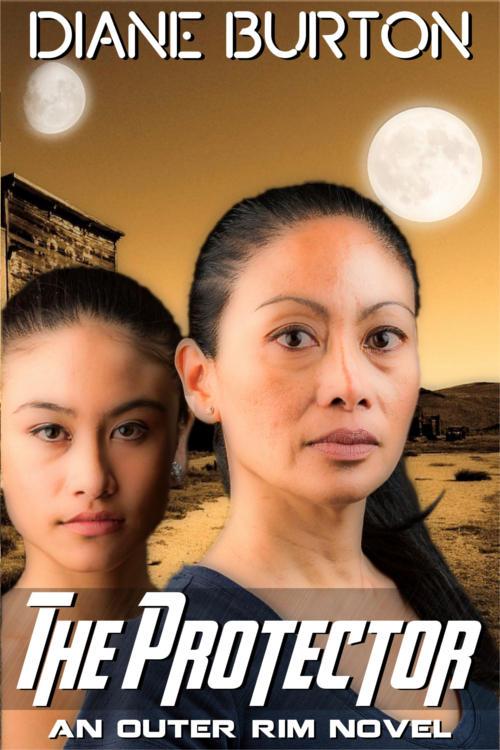 Industrialist heir Dillan Rusteran aids her in rescuing more children. Little do they know they’re about to tangle with a trafficking ring that puts Rissa in danger. Dillan’s loved her for ten years despite her claim she’s too old for him. As they fight the traffickers, will she finally see him in a new light? The Protector will be released this summer. Diane Burton combines her love of mystery, adventure, science fiction and romance into writing romantic fiction. 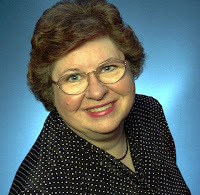 Besides the science fiction romance Switched and Outer Rim series, she is the author of One Red Shoe, a romantic suspense, and The Case of the Bygone Brother, a PI mystery. 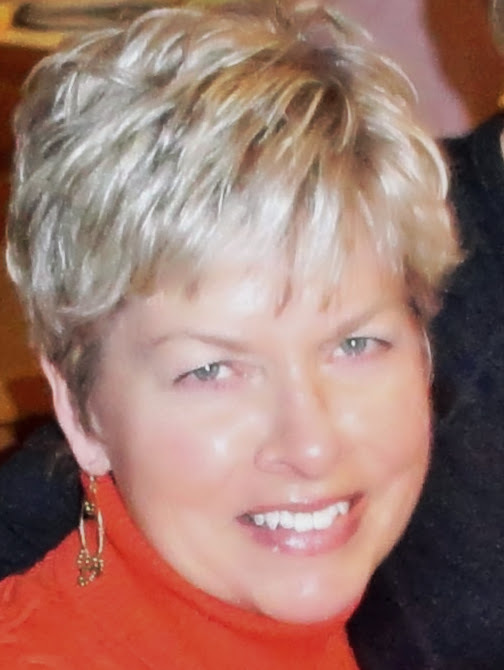 Diane and her husband live in Michigan. They have two children and three grandchildren. Note: The views expressed are solely those of the author, Diane Burton, and not the SFR Brigade. Smart Girls Love Scifi Romance are having a party to celebrate their 5th anniversary, with featured authors and giveaways. Pop along and join the fun! All books are ebooks and all times are Eastern Time Zone. 6 books, $5 Amazon gift card, and a SGL SFR mug! 6 books that span the genre + 10 Gift Card to either Amazon or B&N! Corrina Lawson: The Curse of the Brimstone Contract by Corrina Lawson and a $10 GC to Amazon or B&N. If you are a world traveler, there’s nothing worse than accidentally calling up your loved ones in the middle of the night. They just can’t be as interested in your weird lunch of barbecued octopus eyeballs at 3am. Faster-than-light travel amongst the stars will only compound this problem. If you are trying to coordinate an attack on a death star, how do you make sure everyone shows up before the attack and not a week after? Science fiction has dealt with this problem for some time. The main character of recent sf best-seller The Martian experienced a day, week, and year of a different length on Mars, and had to calculate the difference. He essentially had one clock set to Earth time and one clock set to Martian time. 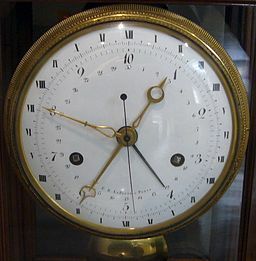 The advantage of a decimal time system is that if you know it is 5 o’clock, the day is 50% over. It’s easy to understand and convert. Some have suggested the Star Trek stardate is a form of decimal time. In the science fiction future, which planet’s clock will become our “Greenwich Mean Time”? Or will we use a planet at all? Every author must come up with their own solution. In my android assassin novel Liberation’s Kiss, I use three kinds of clocks: local time, an “Old Empire” time on which extra-planetary commerce and communications were based, and a new corporate time that the conquerors are flooding across the universe. This is much the way that conquering languages and customs take over now. Cressida passed the rest of the day enclosed in her own thoughts. True to his word, Xan remained out of sight. By the time the second half of a Liberation VI “day” — the hours of tangerine sun plus more hours of intense green planetshine from the gas giant and its three largest moons — faded into true darkness, she had a taste of the future she had predicted to Xan. It tasted like a single meal, consumed alone at a bar, while the solitary night wind howled past. She put away her utensils, climbed the stairs to the second floor, and stood in the terrace doorway, staring out into the darkness. In the glassed cities, the starlight was allowed to filter through naturally to create a twenty-three-and-a-half-hour local day. Soon the Nar would rewire all of the cities to the twenty-five-hour New Empire standard, and no one would see these views but tourists. But tonight, the vast star-spatter looked just that. Not poetic, the way her calligraphy described it. But vast and frighteningly empty. Well, readers, what time systems to you enjoy in your science fiction? If the International Telecommunications Union asked you to define a unit of time (ex. a New York Minute, a Jiffy) what would you call it? What would you think about a future with decimal time? Wendy Lynn Clark is an award-winning author of contemporary and science fiction romance. 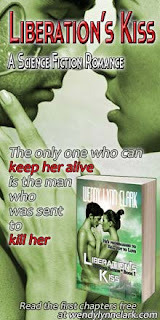 Find out more by visiting her online home at http://wendylynnclark.com. Note: The views expressed are solely those of the author, Wendy Lynn Clark, and not the SFR Brigade. Congrats and enjoy your prize! And that's the end of the Summer Cafe. We hope you all enjoyed our serving of SciFi romance, and thank you for joining us. I read an interesting statistic recently – that children ask an average of 144 questions a day. That sounds about right, since many times with a young child especially, the first Q&A only brings on more questions. We authors might not be young children (any prodigies out there in the Brigade?) or Einstein, but I bet all of us ask more questions than the average adult. If we didn’t, there’d be a severe shortage of science fiction romance to enjoy! 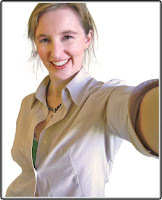 I’m not in any way a structured writer – I use no tools, not even a spreadsheet, I don’t outline, I don’t work with Blake Snyder’s Save the Cat system of plotting – but I do ask questions. I know some people go very VERY indepth when getting ready to write a novel, ‘asking’ their characters all kinds of questions from his/her childhood pet’s name to what’s their favorite color, create elaborate bios…I sincerely applaud you if that’s one of your tools. I figure out the hair color and the eye color and then I’m off, seat-of-the-pantsing. All things about my hero and heroine come to me as I write. In my latest, Star Cruise: Marooned, I discovered my heroine had brothers and they’d abandoned her in the woods one day when playing hide-n-seek. I didn’t know this until the plot called for the hero (and me) to have an explanation for why she’s terrified of storms at night in the forest. So, what questions do you ask when you start plotting a new book? 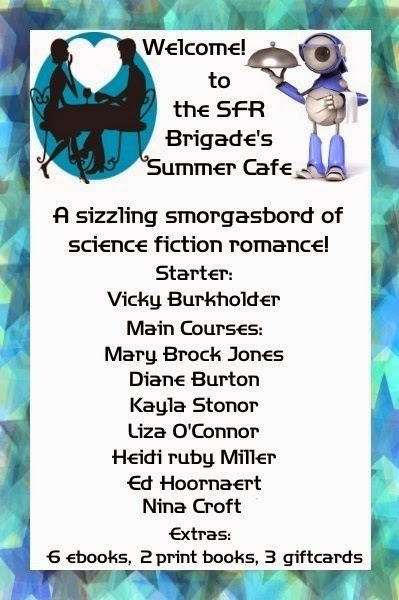 It's Week Six of the SFR Brigade Summer Cafe and our last, and we're serving up the second menu of Space Opera for your enjoyment! In the menu card you'll find our first servings of SFR: starters are shorter length stories, the main courses provide something more substantial, and desserts give you a sweeter finish. You'll also find this week's prize bundle listed under extras, and all the prizes on offer are to the same theme of space opera. One winner will be chosen by rafflecopter at the end of the week (and the rafflecopter only appears on the participating blogs). To visit the participants in the Space Opera 2 menu, simply click on one of the blogs below and show your appreciation at each with a little comment love if you could. Who knows, it might win you some extra goodies too! 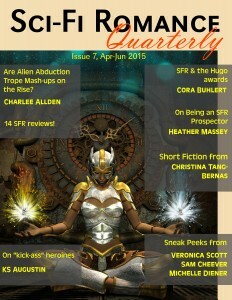 Sci-Fi Romance Quarterly #7 is now out! Here's a sampling of what you can discover among this stuffed-to-the-gills bumper issue--a whopping 98 pages of SFR fun! Head on over to our sparkly new site and download your free copy of Sci-Fi Romance Quarterly #7! Sci-Fi Romance Quarterly is brought to you by KS Augustin, Diane Dooley, and Heather Massey. Happy reading! Congrats and enjoy your prize! Tomorrow sees the start of week six, and our final serving - Space Opera 2!